JVC Professional Video, a division of JVCKENWOOD USA Corporation, has continued to develop its CONNECTED CAM family of products to create the most resilient video transport over the internet. CONNECTED CAM was launched last year with the GY-HC900, a 2/3-inch HD broadcast camcorder available in ENG and studio configurations. This year, the new 500 Series of 4K cameras bring CONNECTED CAM performance to compact camcorders. Plus, JVC is expanding its IP switcher line with the CONNECTED CAM Studio 6000S. JVC will demonstrate its CONNECTED CAM and ProHD products through April 11 at the 2019 NAB Show (Booth C4415) in Las Vegas, Nev. The 500 Series cameras feature a 1-inch 4K CMOS imager and integrated 20x zoom lens with built-in ND filters and manual zoom, focus, and iris control rings. While the 500 Series records several native 4K UHD and HD file formats to SDHC/SXHC cards, the camcorders can also record to SSD (solid state drive) media in 10-bit ProRes 422 at 4K resolution and 50/60p frame rates. HDR and slow-motion HD recording provide additional creative flexibility. To meet the varying needs of video professionals, JVC offers the GY HC500 base model, GY HC550 with advanced streaming and graphics, and GY-HC500SPC sports production camera. Both the GY-HC550 and GY-HM500SPC include integrated lower-third and full-screen titling options without an external CG. The GY HC500SPC adds score overlays for a number of sports, and works with Sportzcast Scorebot for automatic, real-time score updates. Plus, the GY HM500SPC is compatible with DV Sport and XOS Digital technologies for sports coaching applications. CONNECTED CAM camcorders are designed to optimize both image processing and IP performance. All 500 and 900 models provide reliable 1080p streaming performance up to 20 Mbps with SMPTE 2022 forward error correction and less than 500ms latency. Some models also add Zixi™ error correction with ARQ for reliable transmission. Another part of JVC’s video transport workflow is its line of Bridge bonded cellular uplinks, which allow content creators to stream live programming with better reliability. Digital P Media, for example, uses five ProHD Portable Bridge cellular uplinks paired with 800 Series ProHD cameras to stream live coverage of the Fishing League Worldwide bass fishing tournament. Streaming live footage of the FLW Tour is a challenge because each event takes place on an expansive lake, and several lakes on the tour are notorious for poor cell service. The video production crew has been able to expand and improve its coverage – and even use their Portable Bridge units as hotspots, connecting their cell phones via Wi-Fi and using the Discord voice chat mobile app as an intercom system. 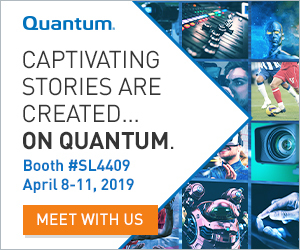 The most recent addition to the product line is the SFE-CAM Dockable Bridge, a Dual Link bonded LTE uplink that connects directly to 800 and 900 Series cameras for run-and-gun applications. An upgraded version of the ProHD Dockable Bridge introduced in 2017, it features Peplink’s patented SpeedFusion VPN Bonding technology to combine multiple cellular, wired, and Wi-Fi connections to create a robust and secure VPN connection. All Bridge units, as well as other JVC IP-enabled cameras in the field, can be monitored and tracked with the ProHD Command Center. It provides a full screen, real-time map of all GPS-enabled resources, plus allows one-touch routing of live video to master control, websites, and social media platforms. From studio and remote production to ENG, live streaming, and point-to-point HD contribution, the new ProHD BR-EN900 encoder is an important part of JVC’s end-to-end IP-based production solutions. The portable encoder provides broadcast-quality HEVC (H.265) encoding up to 1080p60 with 10-bit 4:2:2 sampling. Powered by an all-hardware compression chip, its dual encoding capabilities allow simultaneous H.265 and H.264 streaming to different destinations, such as hardware decoders and CDNs. When combined with JVC’s BR-DE900 decoder, which was introduced last year, the BR-EN900 delivers up to 50 percent bandwidth savings compared to H.264. With JVC’s line of Studio portable live production and streaming systems, connectivity extends through the production process for broadcasters, schools, houses of worship, and governments. 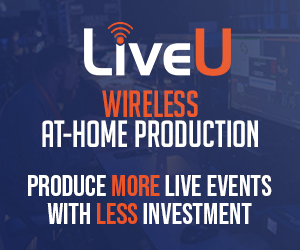 In Cleveland, for example, the ProHD Studio 4000 has provided Raycom Media-owned WOIO the tools to set its live coverage on its website, mobile app, and Facebook Live apart from the competition. The system is based in the newsroom and coupled with a JVC KY-PZ100 robotic PTZ network video production camera. Instead of just a live video feed, operators create scaled-down newscasts, complete with graphics, bugs, archival footage, live Skype feeds, and more. The new CONNECTED CAM Studio 6000S promises even more functionality, with six IP inputs that support NDI® and SRT streaming protocols (as well as HD-SDI and HDMI sources). Other integrated features include an audio mixer, internal CG with templates, four layers of DSK, and clip store with playback. The Studio 6000S also offers features for live sports production, including automated multi-channel instant replay, slo-mo, and an integrated sports CG for scores and timers. Since 2012, when JVC introduced the industry’s first professional camera with built-in FTP and Wi-Fi connectivity, news-over-IP has become a reality and live streaming has become more sophisticated. JVC continues to improve the IP performance of its products. For example, the company recently added Facebook Live integration to the GY-HM250, its most affordable streaming camcorder, to make it easier than ever to share live coverage on social media. With its catalog of affordable cameras and system components, JVC has created the most resilient video transport over the internet that can be scaled to fit the needs of any production facility, from broadcast news to PEG channels and houses of worship.